Public spending on education was 8.3 per cent of GDP in 2011. 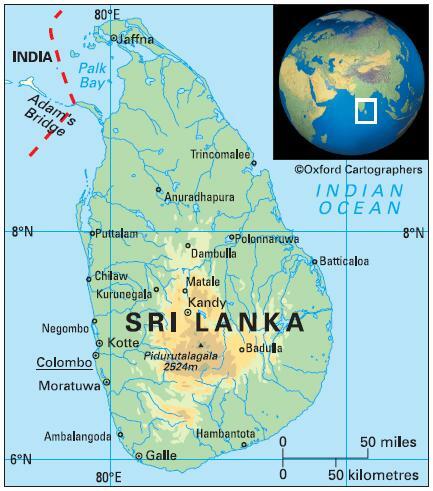 The Sri Lankan Ministry of Education is charged with developing and implementing education policy at the national level. Each of the country’s nine provinces also has a Ministry of Education, headed by a Minister of Provincial Education. There are nine years of compulsory education starting at the age of five. Primary school comprises five years and secondary eight, with cycles of four and four years. Some 97 per cent of pupils complete primary school (2010). The school year starts in January. The University Grants Commission (UGC) recognises 15 public universities and 17 higher education institutes, and there are four other public universities that come under other departments of government (2013). Leading universities include the University of Colombo, which was established – as University of Ceylon – in 1942 when the Ceylon Medical College (founded 1870) and Ceylon University College (1921) were merged; University of Kelaniya; University of Peradeniya; and Open University of Sri Lanka, which provides courses through distance learning. Technical colleges offer courses up to diploma level in engineering and business. The female-male ratio for gross enrolment in tertiary education is 1.7:1 (2012). Literacy among people aged 15-24 is 98 per cent (2010).